To the untrained eye, a fishing boat is a fishing boat, is a fishing boat. To true anglers they know the subtle differences in every style of fishing boat that separate them from one another. One of the more serious fishing boat styles is the big water fishing boat. 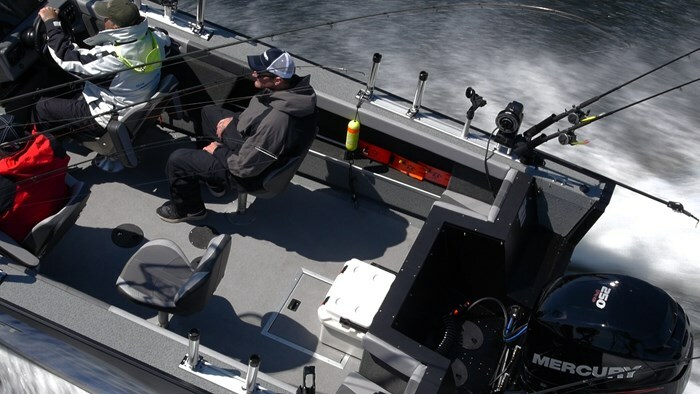 I had a chance to get out and test Starcraft’s flagship big water fishing boat - the aptly named Fishmaster 210. For anyone who has ever spent any amount of time in big bodies of water, from open lakes to the Great Lakes themselves, you know the boating conditions can vary from opposite ends of the spectrum and also change in an instant. You can go from mill pond calm to high sea swells in under an hour. Because of this you need to have a boat that can handle it all while keeping you safe and dry. 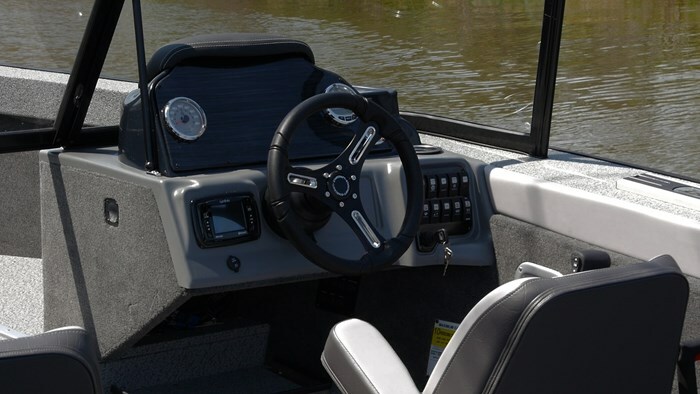 The Fishmaster 210 boasts a transom height of 25 inches and an interior depth of 31 inches. When sitting in the boat it swallows you up inside. But fishermen rarely sit, they’re constantly standing, either adjusting tackle or ready to pounce on a strike. This large interior depth keeps everyone inside the boat when it gets rocking. Starcraft also makes great functional use of the high freeboards. There’s rod storage inside each of the gunnels. The gunnels themselves are covered in vinyl for durability but they’re also wide enough to be used as a step to help get down into the cockpit. 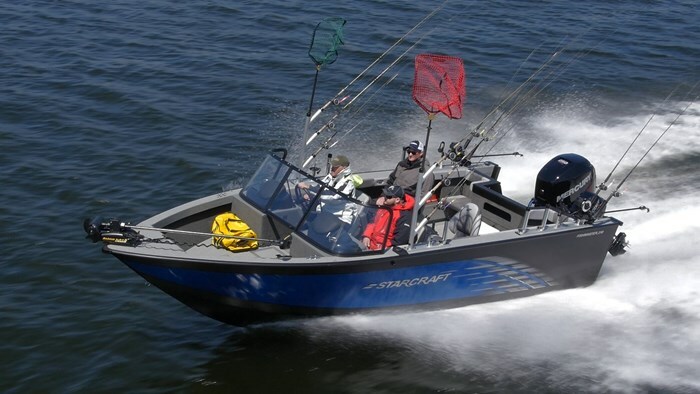 Since there’s so much space up there, Starcraft includes an accessory track system that works perfectly with Bert’s Custom Tackle series of accessories and downriggers. This is a boat that you’re going to be doing lots of trolling and downrigging, with all of the fishing action happening behind the boat. 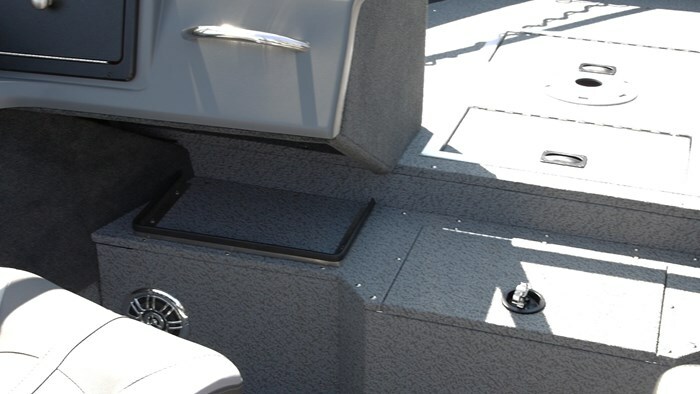 So because of that there is a high splash well in front of the transom that has two nooks that normally hold jump seats, but those can be removed to allow you to get right up to the back of the boat to clip on your cannonball or net that trophy walleye. When sitting down in one of the 4 fishing seats the boat seems to swallow you up. What’s a nice feature about all of Starcraft’s seating and vinyl is that they make them in house in their vinyl shop. So if something happens and you need a replacement it won’t be an issue at all. 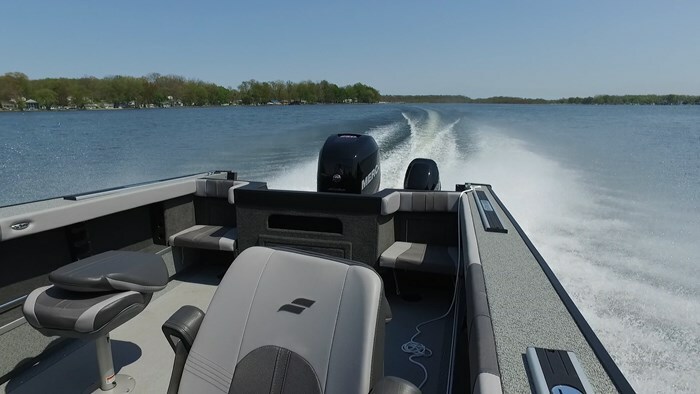 Since the vinyl work is made in house, Starcraft covers it with one of the best Warranties in the fishing market with a 6-year warranty on all the “soft” features like vinyl, carpet, coverings, switches, wires and gauges. “Hard” items like the aluminum, welds, rivets and plywood are covered by a limited Lifetime warranty that’s transferrable to the second owner. It’s things like having one of the best warranties in the business that have kept Starcraft Marine in the business since Harold Schrock started the company in 1903. It’s also because Starcraft has a large fishing pro staff that they keep well equipped but they also ask for suggestions and listen to what they have to say. So with that one of the new things for 2017 is increased dry storage in the Fishmaster, specifically up under the two consoles. 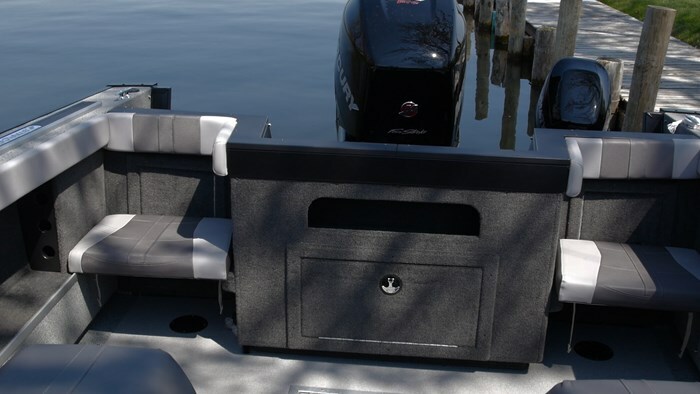 There are spots to put plano tackle trays under the consoles along with a center storage bin that can hold everything from tackle to larger jackets. Forward of this storage compartment is the 41-gallon livewell, because we know big water leads to big fish! Ahead of that is another deep storage bin in the bow. 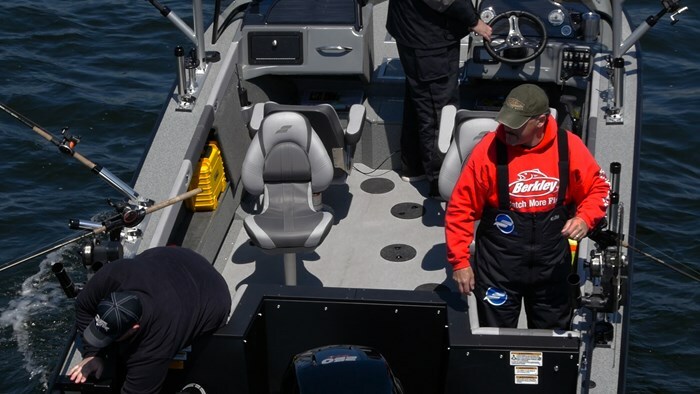 The bow on the Fishmaster can be used for casting, as it has a seat base up there but it’s rare that you will be doing any casting with this boat. But there are times when the fish move into the shallows and you can cast swimbaits at them, so it’s not out of the question. One of the things I envy about fishermen is the performance of their boats. Serious fishermen have very discriminating tastes when it comes to the performance of their boats. They need to get out to the spot faster than the other guy and if they’re on a hot line of fish they will want to stay out longer then race home by weigh in, so their boats need some serious power. The Fishmaster 210 that I tested had a Mercury Verado Pro Fourstroke that just happened to be the max for 210 at 250-hp. Now I’m traditionally a two-stroke guy. I love the sound, the smell and the performance but ever since the Verado came on the scene I was hooked. The impressive thing about their idle sound is almost the lack thereof. It fires up and sits there ready to perform with only a whisper of an idle coming from the motor. When you put the throttle down it bursts to life with a low growl and a surge of horsepower. Hard chines and lots of horsepower got the 210 onto plane in 2.3 seconds and to 30 mph in just under 4 seconds. It settles into a nice cruise of 28 mph at 3500 rpm which is light work for the Pro Fourstroke Verado. Thanks to the high freeboards and hard chines on the 210 you’re going to have a very dry ride. While I was testing the 210 on a rather calm day in Northern Indiana I was still able to find some boat wakes to mimic rougher conditions and the Fishmaster 210 handled them with ease, shooting the water spray out the sides of the boat. 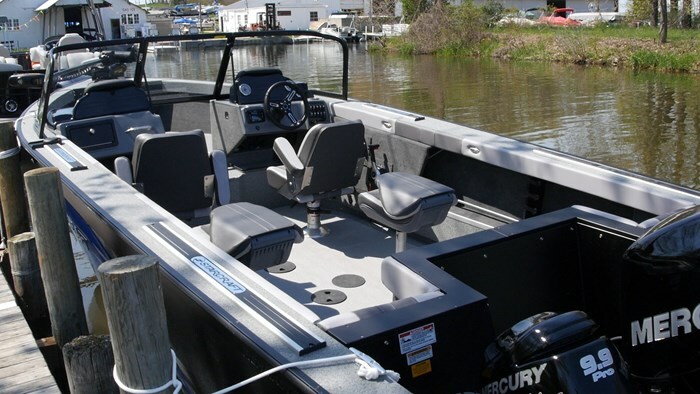 Since this is a big water boat you want to make sure it is built to withstand the harsh conditions that you can find yourself up against out there and the Fishmaster certainly is. The Fishmaster is built with what’s called “torsion beam construction” where if you want to simplify it you can compare it to studs in a wall. Each torsion beam frame is made in a jig outside of the boat then welded into place to make sure each one is perfect. Some of their competitors like to use double plated aluminum, which is basically like adding a second sheet of drywall, it doesn’t help the boat structurally. It’s because of this that the Fishmaster handles the impact of rough water, but has a smooth, quiet and comfortable ride when the water is calm. With straight line performance like a sports car, the Fishmaster 210 hit a top speed of 54.6 mph on GPS. Anytime I’m doing over 50 mph in a fishing boat I am a happy camper. Turns were okay in the 210, but that’s fine because that’s not what kind of boat it is. It’s meant for big, open water running not tight and twisty. If you’re constantly dreaming about chasing that trophy out into the big water like Captain Ahab then maybe your missing link is your boat. Upgrade to the master, the Starcraft Fishmaster 210.